This isn’t exactly the way Michael approached me about doing it, but he did cast me in a hilarious short that we shot over the weekend with a group of extremely talented, funny actors. It’s titled What the F&#$ Was That?! and when it’s ready for viewing, I’ll post the link. Great as usual. Can’t wait to see the pilot! So funny. 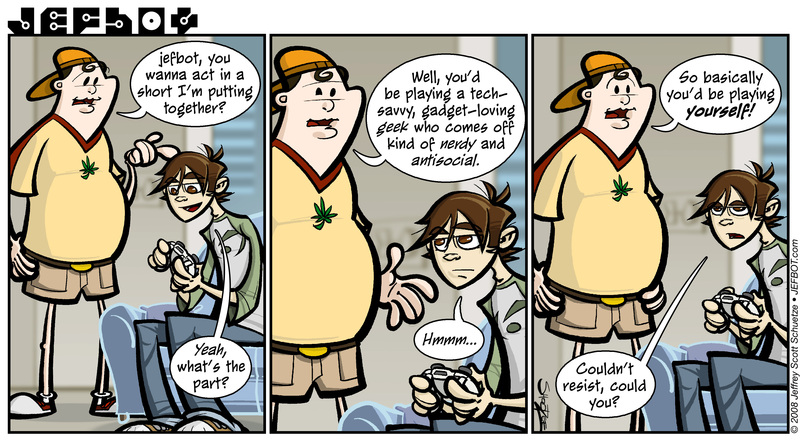 I don’t think you come off nerdy or antisocial! Talented, funny and gifted with anything that requires batteries… Yes! Ha! Jefbot, so funny and so true. But I have to agree with Funnyshaffer, you’re not antisocial…you’re pensive. 😉 Again, really great stip and you were fantastic in the short. Definitely not antisocial. Your social calendar would make Paris Hilton blush. You might have been in a short, but one thing JEFBOT is never “short on”…great comic strips!!! P.S. What’s wrong with loving gadgets? what are YOU looking at!!!! Definitely NOT antisocial!!!! But brilliant!!! And can’t wait to see the short!! JEFBOT : The webcomic and blog of actor Jeff Schuetze » Archive » WTFWT?! JEFBOT : The semi-autobiographical webcomic and blog of actor, Jeff Schuetze » Archive » THE REAL WTFWT? !